Volga river is national river of Russia. Russian people calls it “Mother Volga”. It is also the largest river in Europe in terms of length, watershed and discharge. Besides, there are about eleven big cities in Russia lays in Volga river basin. Volga river starts from the Valday Hills of northwest of Moscow. It flows around 3,700 kilometers and then discharges into Caspian Sea. Its system has a total length of around 357,000 miles. The system consists of 151,000 rivers and intermittent and permanent rivers. As it is very long, there are a lot of animals living surrounds it. At least, there are 5 animals that lives in Volga river. Russian desman is a small semi-aquatic mammal. The diving insectivore that looks like a small mole has tiny eyes and a fat and flat tail. Its body is 18 to 21 cm long while its tail is 17 to 20 cm long. Moreover, its weight ranges from 400 to 520 grams. It lives surrounding slow-moving streams or ponds as it can build burrows into the banks. However, it likes small ponds that provide many preys, like insects, amphibians and crayfish. 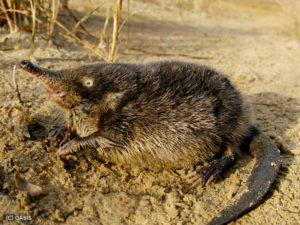 As it is blind like moles, it relies on its sensory input to carry out activities, like building burrows or catching some food. The sensory input comes from the touch-sensitive Eimer’s organs which is at the end of its long snout. There are about 35,000 Russian Desmans which lives in Volga river basin. This number implies that it is in the brink of extinction. This conditions come from the fact that fur trade sought after its fur because it is considered to be more valuable than that beavers have. Furthermore, its tail contains scented musk glands. People use these glands to strengthen the aroma of perfume. Due to this activities, illegal fishing, water pollution and introduction of non-native animal like muskrat, the number of its population continues to decline. Sturgeon is a kind of fish that consists of 27 species. 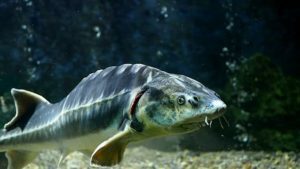 However, those which live surrounding Volga river is Russian sturgeon. These kinds of fish can live quite long. It is recorded that it can live up to 46 years. In addition to being able to live long, it can reach 236 cm long. It also can weight up to 115 kg. Russian sturgeon eats small fish, crustaceans and shells. Although most of them only eat small prey, the adults can swallow a whole salmon. They use a combination of sensors, like olfactory, tacticle and chemo-sensory cues to move and find their prey items. Although it can live long, it is critically endangered. This is due to there are many activities that harvest this species for its roe. Then, its roe turns into fine caviar. That is the explanation of where fine caviar of Russia comes from. Besides its use of caviar, people also harvest it for its flesh. In addition to those activities, this fish face other threats like damming of rivers, water pollution, over fishing and rampant poaching. Pelicans are big water bird that live surrounding Volga river. It has a long beak and large throat to swallow its prey. Its small tongue has strong muscle to form pouch to catch fish. The smallest species is brown pelican. As it belongs to big bird bird, its body can reach up to 1.06 meters long with wingspan that reach 1.83 meters. Meanwhile, the largest pelican is Dalmatian that weights up to 15 kilograms. Moreover, its body can reach up to 1.83 meters long with wingspan that reach 3 meters. 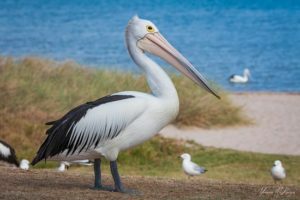 Although most pelicans eat fish, they also eat insects, other small birds, turtles and amphibians. They can catch multiple small by expanding their throat pouch. In addition to big bird like Pelican, there are also flamingos living in Volga river. Like pelican, it has long throat but it has short beak. Its iconic pink color appears on their body after they are 2 years old. Moreover, pink color on their body shows that the flamingo is healthy. Meanwhile, pale flamingo is usually unhealthy and malnourished as they do not get enough carotene they need. 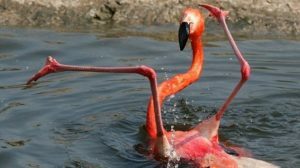 The largest flamingo is 4.7 feet long while standing and weights up to 7.7 pounds. Its wingspan can reach up to 59 inches. Moreover, the oldest flamingo can live up to 89 years. As they are omnivores, they eat larva, small insects, planktons crustaceans, mollusks, green algae and brine-shrimps. 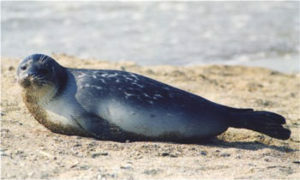 Adults caspian seal are usually around 126 to 129 cm long. They weight around 86 kg. They can live up to 40 years. Males are longer than females at early age. However, females can grow rapidly until they reach 10 years of age. These seals are shallow divers. They can only dive up to 50 m for a minute to find various preys, depending on availability and season. In winter and autumn, they eat crustaceans, sculpins and gobies in shallow waters. Meanwhile in summer, they hunt carp, smelt, herring, roach, and sprat. Like some other animals, this species also face threats. There are a lot of activities that hunt them for subsistence and commerce. Their number are also endangered due to wolves killing many of them. Water pollution is also responsible for the decline of its number. Those are 5 animals that lives in Volga river. You can also read animals that live in Siberian tundra, bear as cultural symbol in Russia and the meaning of birch tree for Russian people.